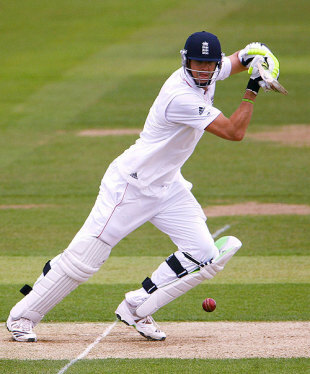 Kevin Pietersen has been accepted as one of England's greatest players. And nobody else from his generation cuts the mustard. That is the remarkable verdict the country's pundits and public have delivered, as we reveal the results of Cricinfo's search for the all-time England XI. This process began six months ago, with the initial deliberations of a select band of 10 jurors, representing the cream of the English cricket-writing fraternity. It was then broken down into six sub-sections - the search for two opening batsmen, three middle-order stalwarts, an allrounder, a wicketkeeper, a spinner and three quicks. The results are quite astonishing, for they reveal a lasting deference to the greats of a bygone era. From the top-order trio of Jack Hobbs, Len Hutton and Wally Hammond, through the mighty stonewaller Ken Barrington, to the all-round axis of Ian Botham and Alan Knott, modernity scarcely gets a look-in. The bowling is equally dominated by the champions of yesteryear. The brutish aggression of Harold Larwood and Fred Trueman, the deadly left arm of Kent's Derek Underwood, and last, but so far from being least, the oldest and most incomparable man on the list, Sydney Barnes, whose tally of 189 wickets in 27 Tests gives a surface-level idea of the threat he posed with his boundless array of seaming, swinging, spinning deliveries. But then there is Pietersen, standing out from the crowd once again, the youngest on the list by more than 30 years, having made his Test debut almost two decades after Ian Botham's career reached its pomp. Admittedly, KP made it to the final reckoning by the skin of his teeth - he tied for jurors' votes with none other than the Brylcreem Boy, Denis Compton, but thanks to the public's vote of confidence he claims his place nonetheless. This accolade is unlikely to come as much consolation to Pietersen as he recovers from his Achilles operation, while facing up to the fact that he was a peripheral figure in England's 2009 Ashes triumph. But then again, perhaps it will prove to be the perfect consolation. Because if there is one thing that Pietersen seeks beyond fame, fortune and glory, it is acceptance. He seems set to divide opinion for the remainder of his career, but right now, KP couldn't be in more illustrious company. We invited readers to vote on the nominees in each segment. Here's who they picked. All-time XI: England What does this team tell us?